While a far off enemy is certainly what the LMG can and should engage, 0.99 max spread lets it do well in CQB as well. Just ADS and you instantly go back down to 0.99 spread. Except that with hipfire per se you cannot kill anyone. Going to ADS is involved with a time cost = TTK cost. And then you still have the deployment time penalty limiting your options for movement. Otherwise, sure, I am not disagreeing. What I'm saying is that in the games I have experience of, and engagements prevalent in those games, I doubt I would see pretty much anything to change when the max-spread issue is fixed. Good that it will be fixed. Fun fact, you can mount both a magnifier and a 4x scope on the m240B. Idk if it works on the others, but i can imagine bipoding up with an 8x zoom and countersniping for days. All praise the ammo box! Have you ever considered our Lord and Saviour M60? ok.thnx.I will change my opinion lmg but i don't know which one is the best.can you guys just tell your favourite. Quoted from "Boss Gamer Pro0"
In a complex game there can never be such a thing as best or the game-balance has been horribly borked. So, depends on how you want to play and what the situation (squad, team, map, mode, ...) needs. The balance in BF4 is now so good that players can even pick guns just by looks or feels and still not be penalized. Considering killing-efficiency as a criterion and a 'general purpose' / 'non-specific' situation, I'd pick PKP (if you have a good aim and trigger discipline) or MG4 (is more forgiving re aim and with HB often does not even demand bursting). If you enjoy mobility and/or really need to shoot far with an LMG, QBB is amazing. They are all pretty good and well balanced (except the U-100: 0.4 Hrec at 590 RPM with a 45 round magazine and 2.75 second short reload? No thanks, the RPK-12 completely stomps it.). RPK-12: one of the best long range fully automatic weapons in the game (if not the best). Great recoil, good velocity, big enough magazine, rather fast reload. Just stay a bit further back than you normally would and mow down people from outside their effective range. I recommend HB + ergo/bipod, depending on map and mood. Optics + accessory is either 3.4x + laser or 1x + magnifier. I usually go with 1x + magnifier: 1x allows you to score easy headshots up close and at range you have the magnifier and big magazine. QBB-95-1: Another great long range automatic, but better on the move than the RPK-12 and with a bigger magazine. Use it with HB, ergo and laser with a 3.4x. Hipfire w/ laser + ergo is good enough to bail you out at close range. Stick a bit further back than you normally would with this one too. MG4: suppressor + stubby. Nuff said. 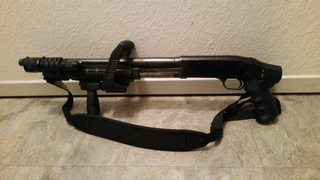 1x optic, attachment is a toss up between laser and magnifier. ADS magdump while strafing at closer ranges, be careful to avoid the long deploy times and peak corners while ADS. 200 round magazine and 1x FSM makes long range quite doable too. PKP: Middle of the road GPMG, kills really fast, reloads fast, doesn't have a front post welded to it. You won't need the 50+ RPM of M240B unless you are playing MetroLocker and the M60 doesn't give you that much more accuracy over the PKP. You have a bit of freedom with attachments: flash hider, suppressor and compensator are all viable, and so are the bipod, ergo and stubby, attachments are laser or magnifier, depending on your optic and intent, optic is either 1x or 3.4x, depending on intent. 2-shot burst at medium-long range, longer bursts and magdumps at close range. AWS: LMG-AR hybrid, good choice on urban maps where better moving spread is useful. Haven't used it that much so I can't really give you advice about attachments, but I run it with a suppressor, ergo and laser coupled with a 1x sight and it works well. There's basically 3 types of LMG and they all have rather different purposes. There's not really any major standouts in each category but some are certainly more popular. 1.) Long Range "Bullet Hoses": U-100, LSAT, QBB-95-1, RPK-12, RPK-74M. These are generally mostly magazine fed, have normal 22 damage bullets and have slow rates of fire - 590-650 RPM, so they wont be all that great in close combat. The advantage of these guns is they generally have very very low recoil and are nicely accurate. You don't really need to tapfire at range, and can just hold the trigger down for accurate laser-like bullet streams. Slap a heavy barrel on them, and either a Potato, Angled or Ergo grip (personal choice really). Don't bother with a bipod for these, they're accurate enough anyway. They're not all that strong for fast paced close range gameplay, so you probably wont enjoy this class of LMG. They're decent at mid-long range though. Of the guns above the QBB-95-1 is probably the best as it has the highest RPM (650) and is most accurate when moving, but they're all very similar so it's personal choice of feel (RPK-74M is my favorite). 2.) Mid Range High RPM LMGs: Type-88, MG4, M249, AWS. These LMGs are the "classic" LMGs. 100-200 round mags/belts, and 700-800 RPM. Much higher recoil than the longer range ones above, but much better in close rnge due to the rate of fire. You should generally use either a Stubby Grip or a Bipod on all of these guns, and probably a Compensator as the barrel (though heavy barrel can work if you can handle it). These are the most versatile LMGs in the game. Of these, the Type-88 is probably the worst as it's slower firing but has lower recoil. Think of it like a hybrid between this category and the first category. The MG4 is generally the most popular LMG and I think if anyone was going to recommend just one LMG then it would be this - it's accurate enough to have good range, kills fast up close, and has a controllable recoil (mostly upward, not too bad horizontal). The AWS is very similar but with a smaller mag and slightly lower RPM, but is a bit easier to control - people often compare the AWS to feeling like a hybrid between an Assault Rifle and an LMG. 3.) Hard hitting HMGs. : PKP Pecheneg, M240B, M60-E4. These LMGs feel very different to all the rest. They all do roughly 50% more damage per bullet than the other types, resulting in the highest damage output of all the LMGs, even though they only have 600 RPM. They're a 4 shot kill at any range, and can work both up close and long range. However, they have HUGE recoil. As a result, you generally need to be either really close to your opponent to take advantage of their huge damage output (as recoil is too high to hit things at range with long bursts), or use a Bipod. They're generally very good weapons to use a Bipod on. You should pretty much always use a Compensator barrel with them. If you arent using a Bipod, opinion is divided on the grip - Stubby, Angled and Ergo all have positives and negatives for them (i favor angled to make them uber at tapfiring but meh at long bursts). Of those three, the M240B does the most damage as it's higher RPM, but aslo has the most recoil making it the more close-range option of the three. The M60-E4 is the slowest firing but lowest recoil and should be considered the longer range option. The PKP sits in the middle and also has the fastest reload time. Personally I think the PKP is the most versatile and the best for running around -without- a bipod on tapfiring, and the other two are both better with a Bipod. But everyone has their favorites. TLDR: The QBB-95-1, MG4 and PKP Pecheneg are probably the best overall and most versatile LMGs in the three respective classes, but the main difference is feel. Try all of them a bit, but make sure you know which category/style of LMG each one belongs to so you know what to expect. Don't choose the U-100 and expect to be able to win duels at 5m range, and don't choose the M249 expecting a sniper rifle. PKP, for everything else than spraying. BF4 quantum dynamics makes all (the two) other GPMGs statistically inferior. M60 can be 2-shot bursted at 513 rpm, PKP and M240B at 600 rpm, so, go figure . M240B gets a TTK advantage over PKP only when the sixth consecutive bullet is fired. For shorter bursts, i.e. all non-bipodded or non-Locker-stubby-max-spread gameplay, PKP is always better. The only real and yet pretty minor upside of M240B is the muzzle velocity. Much self-entitled, someone kick him pls. De facto, M240B does not have a 50 rpm RoF advantage over PKP. With the current game engine, for someone picking guns by stats not feels, there are IMO no good reasons to pick another GPMG than PKP.